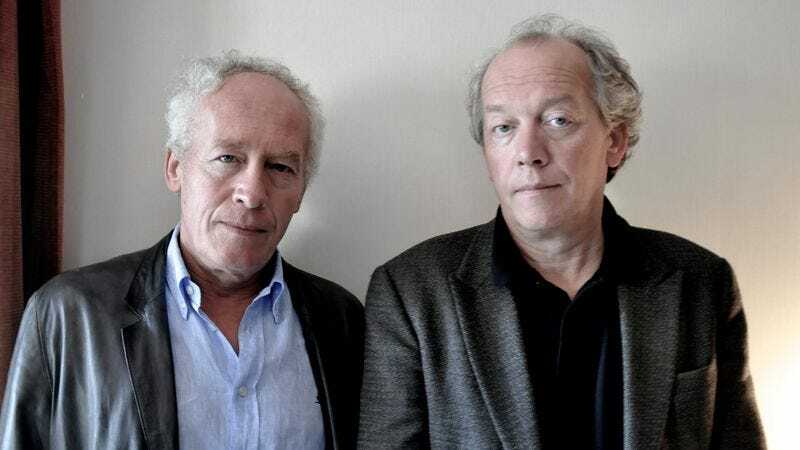 Over two decades and seven features, the Belgian sibling filmmakers Jean-Pierre and Luc Dardenne (Rosetta, L’Enfant) have established themselves as the surest thing in arthouse cinema. True to its title, their international breakthrough, 1996’s La Promesse, actually was a kind of promise—a guarantee of quality the brothers have yet to violate. They seem, quite simply, incapable of making an unexceptional film. Even by their own high standards, however, the Dardennes’ latest, Two Days, One Night, is a stunner. For the first time ever, the two have cast a movie star, Marion Cotillard, as their protagonist. Casting aside all traces of vanity, the actress plays a depressed family woman whose livelihood lands on the chopping block; she has one weekend to convince a majority of her dozen or so co-workers to vote for her continued employment instead of their annual bonus. This door-to-door, hat-in-hand odyssey unfolds in surprising ways, offering a spectrum of altruism (or lack thereof) and resulting in an emotionally resonant career-highlight for the brothers. The A.V. Club sat down with Jean-Pierre and Luc at last September’s Toronto International Film Festival, where we talked about working for once with a major celebrity, the benefits (and challenges) of filming chronologically, and the importance of the rehearsal process. Because of their peerless track record, and the typical mastery of Two Days, One Night, interviewing the Dardennes seemed like an intimidating prospect. But the brothers were lively and engaging, periodically conferring with each other mid-answer and acknowledging, with good humor, the quirks of their methodology. Note: As the Dardennes speak very little English, the interview was conducted with the aid of a translator. There is a small possibility that a couple of the answers attributed to Luc were actually provided by Jean-Pierre, and vice versa. The A.V. Club: Marion Cotillard is the biggest movie star you’ve ever cast in one of your films. Were you interested in playing with her celebrity and visibility, or in making audiences forget them? Luc Dardenne: We knew that it would attract attention, as she’s a very well-known star, but it’s not because of that that we chose her. We really wanted to work with Marion because we had met her through the shooting of Western Walls, which is a movie that we helped co-produce. And we realized that she also wanted to work with us. So then as we started to look more closely at the script to see what the character of Sandra was going to be, we saw that Marion could bring that vulnerability, that fragility, to the character. Marion has this way of being there, being present, but also being somewhat self-effacing, not really being there, not really being fully present. And then she showed the capacity, in a later moment, to turn that around and become very strong and very present. And so it was an interesting collaboration. Marion said at the beginning of the shooting, at the beginning of the rehearsals, “You can do whatever you want with me.” And of course maybe sometimes an actress can say that but it doesn’t go that way. But we really felt there was a coalition among the three of us; we were working really well together. And she really worked under our conditions. She didn’t have a private chauffeur, she didn’t have a private makeup assistant, and she ate with everybody else. It was really, really fabulous to work with her. AVC: She blends beautifully into the world of your film, but was there ever any anxiety about her being a distracting presence? LD: It was a really big challenge, because we wanted to work with her, but also somewhat disassociate the image of Marion the big star, the one that makes all these ads and is really well known. The challenge was to have a physical transformation—to make this big actress more banal. Jean-Pierre Dardenne: We wanted this change to happen in Marion by the end of rehearsals. So we rehearsed every day for six weeks, making little changes, starting the next day with the changes we made the previous day. This is how we arrived at the real characters. For everyone—not just Marion. LD: Rehearsal is very important for us. AVC: Is it different to direct someone like Marion, as opposed to an unknown or an actor who doesn’t have as much experience? JPD: [In English.] Yes and no. [In French.] We rehearse for six weeks and shoot everything chronologically. Marion, who is in almost every scene, is there for six weeks. So this helps the actor abandon themselves and the defense systems they have. They become the character. LD: It’s during the rehearsals that the actors build trust with each other, but also trust with us, and it’s through this process that the characters can be born. It’s repetition, repetition, repetition. The actors that are already really well established know they’re good actors. Someone like Marion can get to a point where she starts to hide behind technique, because she doesn’t want to be vulnerable. But that ends up being an obstacle for the character they’re playing. On the other hand, the new actors that have never performed before often come to the shooting feeling that they just need to be themselves. And that’s also not good because there is lots of little things—little details, little habits—that they have in real life that might not serve the purpose of the character you’re playing in the film. So they need to be able to let go of those, and maybe let go of being too much themselves. What we find is that through the six weeks of repetition, everybody is able to arrive to their character, without anything that serves as an obstacle or a way of hiding themselves. JPD: And repetition is, for us, a lot about the physical aspect. The way an actor moves, the way they fall down, the way they get up, the way they eat, the way they… everything. LD: The big actors have to forget their image of being a big actor. You have to do that to really be able to embody a character. AVC: So you shoot all of your scripts sequentially? AVC: Logistically, though, it must be difficult sometimes. You shoot at one location and then five days later come back to it. JPD: [In English.] It’s expensive. LD: Yeah, it’s very expensive. Because oftentimes we leave the set dressing as it is. We take the lights, but we leave the scenario as it is until we come back. Filming this way allows us to really have a better sense—to feel things better, to feel the decoration, to feel the story, to feel the characters. We put the money in the time. AVC: Marion has spoken about one scene that took 80 takes or something to get right. Do you know which scene she’s talking about? JPD: [In English.] Yes, we know. I remember. AVC: Which one is it? JPD: The scene in the house. LD: [In English.] It was 81 takes. JPD: [In English.] From the bathroom to the bedroom. When she falls. LD: [In English.] Near the bed. JPD: Certain times it was technical problems. I’m not diminishing the fact that it was a lot of repetitions, but in the case of a few of them, there were technical problems. LD: The space we were working in was very small. You needed almost, like, choreography to have it all together and to have it all working, because sometimes it would be one misstep and then a cable got disconnected, or the camera couldn’t really get through at the right time and to where it had to be. We also like to have things in different rhythms, just to see the difference. When we have long takes, we generally don’t do editing by cutting in the middle. Maybe we don’t know exactly where we’ll start or where it will end, so we’ll do cuts beginning or ending, but we don’t do cuts in the middle of the long take. So we like to have different takes with different rhythms. So maybe a little slower or a little faster to then be able to choose which one is the one that works better for the entirety of the film. JPD: In this particular scene, there’s also silence, which is important, and that’s what they were playing with. How much silence are you going to have? Sometimes it just takes time to really find the right take. Also, in that specific scene, when she’s falling, there is a moment where she needs to show a bit of surprise, sort of a shock that she’s falling, so the camera is going to show her face and then she’s going to pass under the field of view, and the camera will have to go down with her. The timing of that movement has to be precise. Because if the camera doesn’t really stay up for a little bit, it’s almost like, “Oh, it already knew that she was going to go down.” So it’s not so natural if it follows her right away. It needs to be more like in real life, like if someone falls, you look down a second later. If you don’t do a long take, then it’s easier, because then you do the fall and you edit it and the next take is going to be you down there with the fallen person, the character, on the ground. But when you do a long take, then it’s a little bit more difficult, because then you have to make the timing work. LD: Also by repeating, repeating, repeating, what happens is that the actors stop thinking about it. They’re tired, so it becomes in a certain way more natural. It’s like when you’re a kid, you’re learning to walk, so you’re thinking, “Okay, one foot and then the other.” But as you grow up, you don’t think anymore; you’re just walking. So it’s the same as what happens here for the actors with the repetitions. There is less thinking. They are just becoming. AVC: You both have a background in documentary film, and many of your movies adopt an almost verité approach, simply following characters through the streets. But you’ve hinted that even these scenes are very carefully blocked, down to where objects are placed. LD: A lot of times there will be obstacles that are in front of the camera, because the camera is oftentimes following the character. Is that just an accident? Of course we thought about it. What we really want to indicate is that the scene is not happening for the camera. So we place obstacles in its path, so the camera has to move, it has to navigate, in order to get a better view. It’s like reality is not allowing you to really see the whole story so you have to move around in order to capture the whole story. But it has to be the right amount of it, because you don’t want also this hiding of the camera or these obstacles that come to the camera to feel like a pause. Marion, actually, is really good at sensing the camera, and sometimes we have to do several takes in order to make sure she isn’t facing the camera. There’s the scene, for example, where she goes out to this house that is on the outskirts—in the field, it’s the red house—to talk to Anne. Sandra starts to cry a little bit in that scene, and so it needs to be the right angle, where Marion’s not crying at the camera, but she’s not turned completely away from it either, because then you don’t see really what she’s doing. It’s very subtle. It needs to be the exact amount. And sometimes it requires several takes. JPD: There is no recipe for it. Each scene is different.